Nothing says parenting quite like driving through traffic and one of your kids yelling that the other is going to puke. So you turn quickly (Tom was driving), grab the nearest thing to catch it so it doesn’t spew all over the kid and car, and it just happens to be their winter jacket. Side Note: jackets aren’t easy to catch puke in. The gift ideas above are only from retailers that guarantee you’ll receive it this week. I can’t believe it’s 10 days away. Films With Leading Women are Outperforming Ones Starring Dudes. Friends Monopoly is available, aaand it looks amazing (picture that in Chandler’s voice). Christine McConnell is even amazing at Christmas. NPR’s Book Concierge. A Guide to 2018’s Great Reads. You Are Cordially Invited to Watch the First Teaser for The Downton Abbey Movie. How to Sort Your Closet Like a Professional Personal Stylist. Slow Cooker Mulled Wine. Perfect holiday drink. 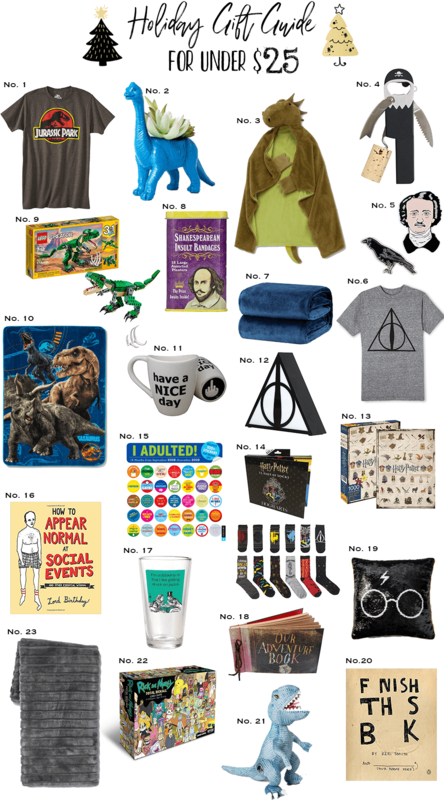 You can see some more Gift Guides here.